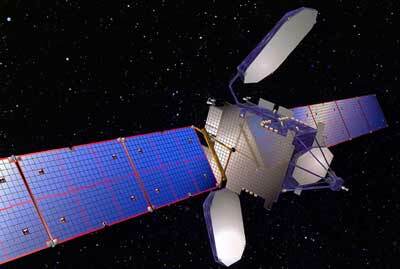 In August 1996, Hughes Space and Communications International, Inc. (HSCI), Boeing Satellite Systems International, Inc., signed a contract with SATMEX - formerly owned by Telecomm - for Morelos 3, later renamed SATMEX 5, a Hughes HS-601HP body-stabilized satellite. SATMEX 5 was successfully launched on an Ariane rocket on Dec. 5, 1998. SATMEX 5 is a Hughes HS-601HP or "high power" version of the body-stabilized spacecraft. It features more than 7,000 Watts of payload power, at least 10 times the capacity of Morelos II. Through such innovations as dual-junction gallium arsenide solar cells, radiation-cooled traveling-wave tube amplifiers (TWTAs), advanced battery technology, and a xenon ion propulsion system, XIPS, the HS-601HP can carry payloads twice as powerful as those on the HS 601 models, with an expected 15-year mission lifetime. The enhanced design enables the satellite to provide improved services, such as business communications, television distribution, educational programming, and others, with high reliability, heritage, performance and value. Additionally, the Ku-band geographic coverage area will be capable of receiving direct-to-home services with 60 centimeter or smaller antennae; EIRP and G/T margins for worst case are more than sufficient for digital broadcasting. The satellite beams expand the coverage to the whole American continent, providing services to countries such as Argentina, Brazil, Chile, Colombia, El Salvador, Peru, Venezuela and the United States, among others. SATMEX 5 was built in the Integrated Satellite Factory of Hughes Space and Communications Company in El Segundo, Calif. As with the earlier Morelos and Solidaridad programs, the working team consisted of both Hughes and Mexican personnel. Mexico sent more than 10 engineers to work on the design and integration of the spacecraft. The XIPS propulsion system of SATMEX 5 failed on 27. January 2010. SATMEX was acquired be Eutelsat in 2014 and was rebranded Eutelsat Americas. In May 2014, it was renamed Eutelsat 115 West A. The satellite was retired in 2016 and was moved into a graveyard orbit above the geostationary belt.